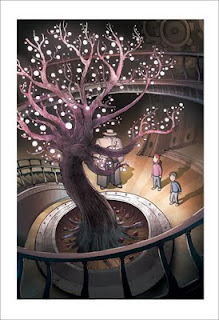 After years (literally) of meaning to get to it, I have finally read Kazu Kibuishi's beautiful Amulet: The Stonekeeper. And the first thing I wrote down in my journal is: it's wonderful. Emily, Navin and their mother move to an old family house on the outskirts of a town after a very difficult family tragedy, to try to start a new life. They attack the accumulation of dirt and dust in the old house in a determined way (this part made me laugh out loud) but their first night, things go horribly wrong. Investigating a noise in the basement, their mother disappears -- and Emily and Navin must undertake a perilous, fantastic journey to get her back. This is the first book in a series, and I believe the second book The Stonekeeper's Curse is on its way at the beginning of September. Very exciting! And it really is wonderful. This book deals with big situations and a lot of grief and fear for young people, but it does it in a plain, understandable (insofar as big griefs are ever understandable) way. Which is not to say that this story is simplistic -- not at all. Just when I thought I knew who was good and who wasn't, I started to second-guess. One is left with the suspicion that nothing is really quite as it seems, and concerns that while Emily made the only choice available to her it might not in fact have been the right one. I really enjoy both Emily and Navin. Navin in particular. My enjoyment of Navin made me think: why do I like him better than I like Emily? Emily is clearly the main character in The Stonekeeper, and she's very sympathetic as a sad, frightened, but determined and spunky kid. But she's got the weight of responsibility on her that makes her slightly less fun. She's focussed on getting their mother back in a single-minded, heroic way, as she should be; Navin is free to get distracted by giant pink herbivorous slugs. Navin is free to beg Emily not to take on the amulet, but Emily has to make the choice despite it's rightness or wrongness. This is something I find common to a lot of fantasy -- the main hero is more boring than the supporting cast (I'm looking at you, Garion, and you, Frodo) because they aren't free to be more interesting. They have a Quest. They have to answer to the Quest. Everyone else can be funny and charming, but the hero must Seriously Pursue the Quest. This isn't a criticism, by the way. I do still really like Emily (and Frodo and Garion) but I thought it was interesting that I reacted in a similar way to Emily as I do to many other heroes in fantasies I've loved. There are other heroes I've loved in other fantasies, but it's not uncommon for me to feel a little bit less in empathy with the hero than I do with the characters around the hero. The art is just so cool. And it is beautiful, and supports the mood. It is clearly drawn, the action is supremely easy to follow, and the panels are so detailed and rich. Every panel is invested with a kind of light and energy. Kazu Kibuishi caught me with Copper years ago, and I've always loved his fantastical, almost-steampunk worlds. So to spend an entire novel in one of those worlds is a treat. The second one is coming out soon... I am quite excited to see it, and anxious to know what happens to Emily and her family. Though I have some suspicions, bred of many years of reading fantasy and fairytales, about how things are going to turn out, I also suspect that there will be surprises in store. 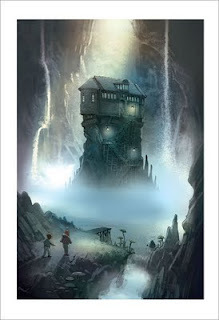 Highly recommended, for anyone ages 8 or so and up who likes imaginative adventure tales. Male or female; I think both are equally likely to enjoy this story. I couldn't even put my favourite illustration up, because it contains a (minor) spoiler... but the whole book is full of lovely, imaginative and accessible art. I'd love to hear what you think of it! Ha! That's a great insight. It would explain why I tend to favour the "sidekick" too in most stories. Whoa, really beautiful artwork. And a glowing review? I will absolutely check this one out! Thanks for the review and for posting images! Mandy, since the second one is coming out this coming month, it might be a good one for you guys to keep in mind. I have no idea how well it has been selling, but it's one of those ones that I wish *would* sell more. It's a very fast read -- I hope you enjoy it!